We offer primary flight training using Piper PA 22-20s, affectionately known as "Taildraggers", or conventionally geared aircraft. That just means that they have a little wheel at the tail of the aircraft. This is the way all aircraft were configured back in the good old days, requiring a pilot to learn better directional control than what is required of tricycle geared aircraft more commonly available today. This is Dave, our Chief Pilot. He looks mean, doesn't he? forward to flying with you! The old saying is "You're not a real pilot until you can fly a Taildragger!" is actually a very profound statement. We've found that Taildragger trained pilots have much better control of any airplane they fly, including the high performance aircraft we use for advanced flight training. We have two Taildraggers and we love 'em both! For those of you who're already pilots and are ready to come over to the dark side of Taildraggers, and you're finally ready to become a real pilot, come on in, the water's fine! One of our Pacers is STOL (Short Take Off and Landing) equipped for those of you really ready! Mountain flying, you ask? Of course. Let's take a trip up to Packwood, Washington, right over Spirit Lake on the north side of Mt. St. Helens. Yes, that Mt. St. Helens, it's in our back yard! 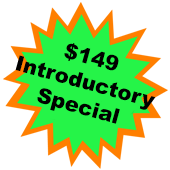 We also provide multi-engine flight training and time building for those pilots working towards meeting airline time requirements for employment. Our partner companies Twin Time, LLC and Twin Time California, LLC, have been involved in airline pilot preparation and certification since 1984. We have many hundreds of alumni who are currently flying for every regional and major airline in the US and for many overseas carriers. We operate Piper PA 30s, Twin Comanches. These aircraft are instrument, all weather certified, fast and reliable. Although more challenging to land than some other trainer type aircraft, here again, the effort is worthwhile in the results achieved for the developing pilot. The national first time pass rate for Certified Flight Instructor applicants is only 25%. Our first time pass rate for that certification has been 100% for decades. We are routinely complimented by the FAA for the level of preparation of our applicants. 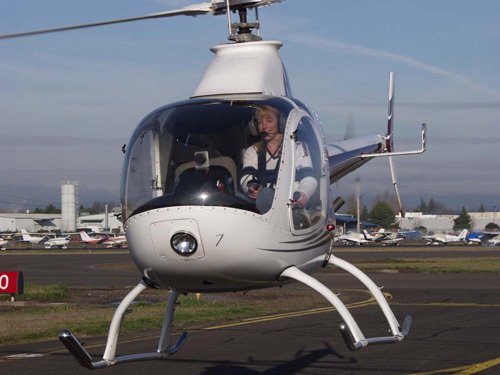 We also offer helicopter flight training for owners, builders and buyers of Rotorway 162F and Talon 600 helicopters. This growing breed of helicopter gives the average person the opportunity to experience the fun and challenge of building and flying your own helicopter. 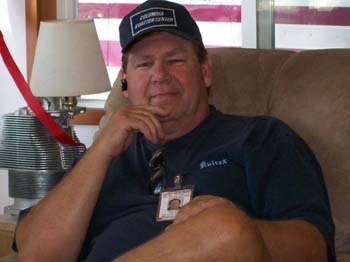 Our Instructor, Dave Burhardt, is an experienced pilot and instructor in Rotorways and many other helicopter types as well as experimental aircraft design, construction, and operation. Here's Marci on her first solo flight in the Exec 162F. Looks like she's having fun, doesn't it? Copyright 2011 Columbia Aviation Center, LLC.